In a large pan, gently cook the mince. Squash it and stir it as it goes. When done, with a slotted spoon, lift it out of the pan and use the back of a spoon to squeeze out the rest of the juice form the meat. Turn up the heat and add the veggies to the juice. Stir, reduce heat, put lid on and leave to cook until softened. Stir occasionally. When the veggies have softened, add the mince back into the pan and stir. Once mixed together, add the flour, stir and cook for 1 minute, stirring as you go. Add the stock and again stir. Add in a good squirt of ketchup and salt & pepper to taste. Leave covered on a low heat to simmer for 30 minutes. Boiled the potatoes, when soft, mash. While mashing, add in the butter and milk. Use enough milk to make the mash smooth. When the meat is done, place it in the bottom of a suitable sized oven tray. Cover this with the mash, trying to put the mash on top of the meat and not mixing it. Smooth the mash with the back of a spoon and then use the back of a fork to make a series of lines in the mash. Put in oven at 200 deg C for 20 minutes. To get a nice crispy top, you may need to place it under the grill for a little whiles. I like to make my mash leaving the skin on the potatoes. This way it tastes a lot more potatoey:) You also get a lot more nutrients this way. Today after supposed to be walking and being health with the Scouts and having bad weather cancel play, I dropped by the hardware store. I wanted some fire bricks for the Weber. 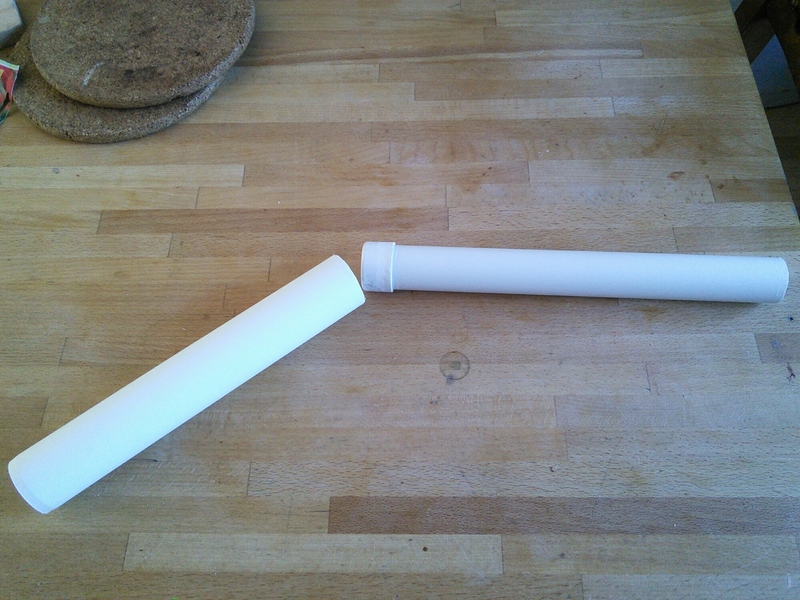 Sadly they didn’t have any but they did have the above mentioned PVC pipe. So I got some with the fatty piston in mind. Hint if you make one of these, PVC pipe dust gets every where. So, what am I going to make with this? It tastes seriously good. Far better than regular BBQ chicken. Reading around a bit, it became apparent that this was a whole new adventure. Terms like ‘brining” were appearing and there was little old me thinking it was all about just burning meat. Well – it’s not. “Low & Slow” is the order of the day. 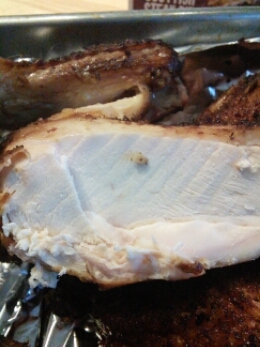 I brined the chicken in 5l of water in which was dissolved 1/2 cup salt and 1/2 cup brown sugar. Yes – I know I should give weights but tough – all the recipes you find will be in American so live with it;) This took 24 hours in the fridge. A little tip I discovered was to use the salad drawer in the fridge. Also a good excuse to clean it out. Once brined and washed under cold running water, I left the chicken to dry for an hour. This gave me time to get the fire going AND soak the wood chips. How to dry a chicken? Laying out the fire for smoking is a bit different than regular BBQ. The idea is to be able to get a constant low heat source somewhere int he region of 100 deg C to 120 deg C. This sounds low but it isn’t. Some sources give even lower temps but I’m a bit cautious here. Also as this is going to take a long time and your coals will burn out, you need to think about how to add extra fuel during the cooking time (and wood chips for that matter, after all, you are smoking right?). You also need a heat sink to stabilise the temp AND capture the fat from the meat. An aluminium try with a liter of BOILING water was what I used. An unlit bed of briquettes. Use a starter chimney – brilliant device. Make sure the water is boiling to begin with. So far, so good. What about the bird? Cut in half and seasoned, after drying of course. It is possible to marinade the meat. In my case I just used rub of salt and pepper on the inside and Weber BBQ Beer Can Chicken on the outside together with a little olive oil. The oil helps the skin go golden brown and crispy. Perhaps I should have not used any rub the first time, possibly, but I’m sure this won’t be the last one do. I’d prepped the grill with a rub of veggie oil before putting it on the coals. I’d also positioned the fire to be perpendicular to the handles. This is an important point. If you have to move your Weber then the handles don’t need to be hot. Also I suspect the heat probably isn’t too good for the plastic. I added the wood chips (Weber FireSpice Apple chips) that had been soaking for an hour. How much wood? Probably you need four handfuls. Put on half the chips to begin with. This will give a LOT of smoke but thats ok. You have the lid on and the meat is most receptive to the smoke before it is cooked. A side note about temperature regulation. It needs to be learned and it needs to be done slowly. On my Weber, there are vents top and bottom. If they are fully open then a lot of air can get in. If there is a lot of air, the fuel burns quicker and hotter. This is not good. To keep the temp down and fire going slowly, I closed the vent at the bottom almost all the way and left the vent at the top only a little open. You wouldn’t think it at first that this would make a difference – but it does. The fire was still probably too hot even at this point. I added some more wood chips to smoke again and left it for another 30 minutes (sans sausages – hey – I had to eat at some point). After another 30 minutes I added some more fuel on top, even though probably I shouldn’t have. The temp was now much more acceptable – around 120 deg C. But of course the temptation to mess with the air settings came in and I opened it up and the temp went up. All things to learn for next time. It looks good and smells awesome. The taste? I have left the meat to rest (under foil) and as it’s now really quite late, I will taste it when it’s cool:) Breakfast will be interesting. Read part 2 tomorrow to find out how it tasted, what it looked like and allow me to bore you with my findings. Last year I bought a Biolite Stove. It’s a cool little thing that allows you to burn wood for cooking and charges up a USB device at the same time. Fan assisted it helps burn the wood efficiently and without much smoke. On the whole my experiences with it both in the garden and in real camping situations have been very positive. So where is the but? So why post a picture now? Well – largely because I can – and also because I want to. That out of the way. What else is cool about the grill? You can put it in the dishwasher to clean it. Always useful. The meat cooks really well. Those burgers on the picture are thick. They cooked well, all the way through and remained juicy without getting burnt to a crisp on the outside. Not bad considering the heat that the grill can give off. And its coming summer. It’s BBQ season. Thats not really true. The first BBQ of the year was had the end of January! It’s been a VERY mild winter.